Coconut oil has been called the healthiest dietary oil on earth. If you’re not using coconut oil for your daily cooking and body care needs, you’re missing out on one of nature’s most amazing health foods. Coconut oil is nature’s perfect food and there are an incredible number of benefits to using coconut oil in everyday life – from minor infections to serious diseases, coconut oil cures it all. After being demonized as an artery clogger for the last 60 years by the majority of health care officials and the mainstream media, coconut oil stayed out of the public consciousness until now. Multiple studies on Pacific Island populations (who get 30-60 percent of their total caloric intake from fully saturated coconut oil) have all shown nearly non-existent rates of cardiovascular disease, kidney disease, and obesity – issues we have come to accept as only being cured by pharmaceuticals. We now know that not all saturated fats are created equal. Coconut oil is composed primarily of medium-chain fatty acids (MCFAs) that are burned almost immediately for energy production. Studies have shown that coconut oil can successfully overpower viruses that cause influenza, herpes, measles, hepatitis C, AIDS – and more. It’s also great fuel for your brain and has proven especially beneficial for Alzheimer’s and dementia patients. There are a lot ways to use coconut oil and just a teaspoon or so a day could make significant differences in your health. 1. In Cooking: Replace butter and other cooking oils with coconut oil. Unlike other oils, coconut oil won’t produce free-radicals upon heating like other vegetable oils do. 2. Face and Body Lotion: Coconut oil is without question the best natural skin lotion available. It absorbs quickly and won’t leave your skin feeling greasy. A single jar of coconut oil can be used as a face lotion, body lotion, anti-wrinkle cream, eye-cream, stretch mark cream and massage lotion. And it smells amazing! 3. Hair Care: Coconut oil makes a great hair mask. Simply melt a few teaspoons of coconut oil and apply to your hair. Let the natural oil soak in to your hair for a few hours before washing it out. It will leave your hair very shiny and smooth! 4. In Smoothies or Juices: Coconut oil is the perfect addition to any smoothie. It adds a sweet and nutty taste and creates the most smooth and creamy texture. And the extra bonus is that the fat from the coconut oil actually helps your body better utilise the minerals and vitamins from the fruit juices. 5. 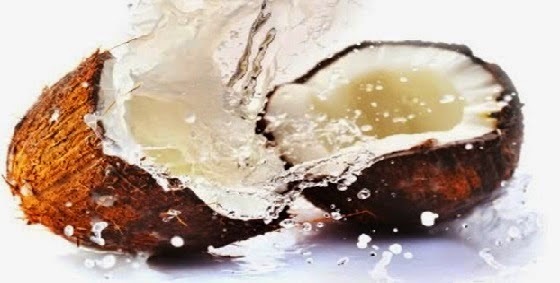 Sun Screen: Coconut oil has been used as an effective sunscreen for thousands of years by indigenous pacific islanders. Coconut oil applied on the skin protects against sunburn and cancer. Approximately 75% of commercial sunscreens contain toxic chemicals that are linked to cancer and disrupt hormones. Dr. Bruce Fife explains the benefits of coconut oil for the body and the skin.